Dang lots of cool stuff! I didnt even know this forum existed........Consider this being hospitable! Haha welcome to the community man! Application removed or only hidden? Redo or no? Thanks! Yeah I found it. Thanks cup! We'll get you promoted tonight in-game, Dim and later on TS3. Wa Wait, so did you reapply in the right manner? Haha it came from is email I am sure. The web app only registers if someone read something if they read it through the website. I get an email sent to my gmail address each time someone sends me a message. This email goes directly to my phone. Generally, I read it on my phone first and then go to reply later. However, he must have just fixed your problem and not responded. We'll chalk that up to the fact that he is just very busy! Thanks for introducing yourself! We could use some more females around here :-) You have found yourself a great community. The two games that dominate this community in terms of members and activity are BF3 and PS2. Both of them have forums that are in the thousands of posts. We are very active in both communities, and I believe you will find lots of people you'll enjoy playing with in either one! Also, we have so many other games that we have a presence in. Feel free to check any of them out! Get those 10 posts and put in that pplication for membership! I don't see you have officially applied yet, just registered for the forums. So check this out and fill out the application form. 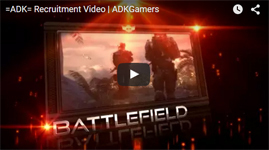 http://www.adkgamers.com/forum-6/announcement-1-adk-recruitment-read-first/ or http://www.adkgamers.com/form/form/1-adk-membership-recruitment/ PS are you really from Afghanistan?? Welcome to the community Dim! Listening to you lead last night was great. You did a really good job. Nice work splitting up your platoon and sending other squads off to do tactical missions and then bringing them all back together at a place with heavy firefight. Good work, that's the type of tactics we need from our PL's. Soo avid OC'er? Whats your OC and temps during PS2 gameplay? I am running a 3770k (3.5ghz) oc'ed up to 4.5 ghz (1 ghz yield!). Also, during PS2 and other peak times it only reaches up to 55 degress (Celsius of course). I believe prime95 it gets up to like 73. Please share! Thanks for joining the community Omega! Good to have you.